When you're hurtling down the mountain at white-knuckle speeds, you need to be confident that you've got the traction you need. 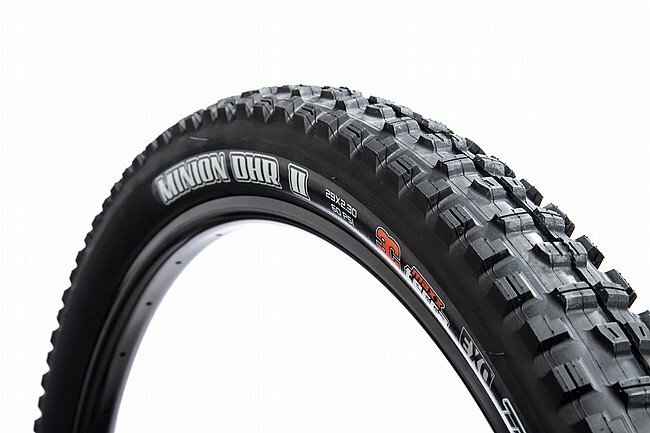 Introducing the Maxxis Minion DHR II 29 inch tire. Taking their DHF tire as the starting point, Maxxis gave it a complete redesign to optimize it for rear traction, including beefing up the shoulder knobs and redesigning the center tread to provide the optimal mix of fast rolling and superglue-like grip. Maxxis' 3C rubber compound makes up the bulk of this tire, providing a long lasting and tacky rubber that won't give up. Of course, with the EXO casing backing you up, you can rest assured that no mere root or rock will give you a hard time, this durable casing will keep you rolling through the worst the mountain can throw at you. To take things to the next level, Maxxis made this tire tubeless ready for an extra bit of weight savings and traction.